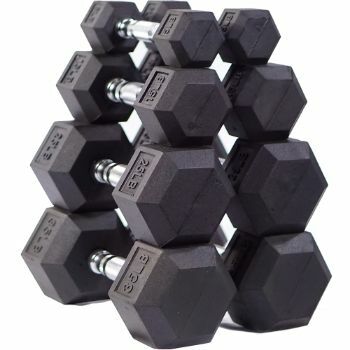 Vulcan Rubber Hex Dumbbells are sold in pairs. Dumbbell weight variants are available from 5 lb - 120 lb lb. The traditional hex head dumbbell design has become a staple in gyms across the world. The Hex Rubber dumbbell is price is an economical yet extremely functional and durable dumbbell for any application. All dumbbells have knurled chrome plated handles which are contour shaped for easy gripping. Dumbbell training can offer versatility that cannot be found with traditional barbell lifting. Training the body unilaterally and bi-laterally can stimulate muscle growth as well a total body strengthening effect shoring up strength discrepancies. Dumbbells can be used for rehab work, conditioning, and floor based movements in ways that barbells cannot. One arm Olympic style lifts can be performed with dumbbells with less risk of injury and minimal coaching as compared to barbell or kettlebell movements.